Spain is a parliamentary monarchy in southwestern Europe, occupying the greater part of the Iberian Peninsula. The Balearic Islands in the Mediterranean and the Canary Islands in the Atlantic Ocean off the coast of Africa are governed as provinces of Spain. The area of Spain, including the African and insular territories, is 505,990 km². Madrid is the capital and largest city. 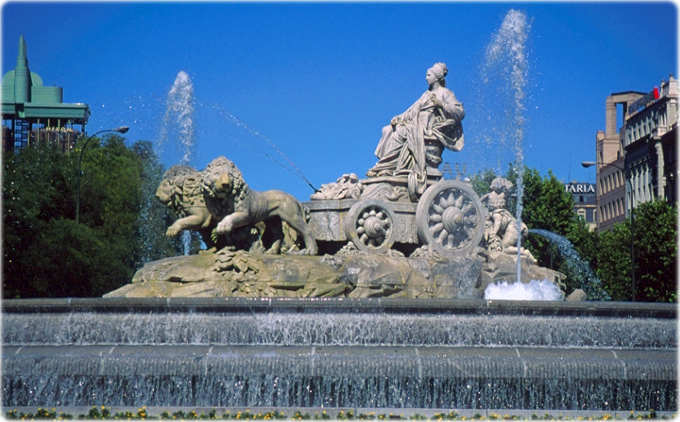 The Cibeles Fountain, in Madrid. Above, view of the Alhambra Palace in Granada.